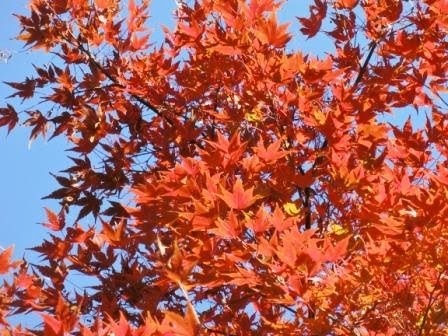 Fall Foliage (autumn colors) finally arrived in Tokyo City before December! 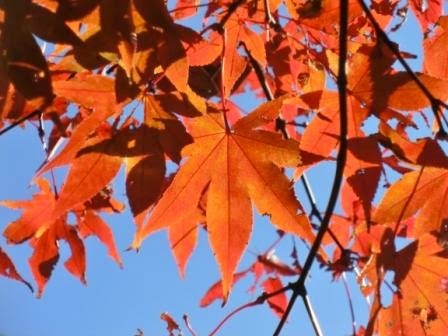 I’m uploading many beautiful photos of autumn leaves at the peak right now. As a part of Tokyo Direct Guide, practical guides are at the bottom of this article. Photos speak more than words. 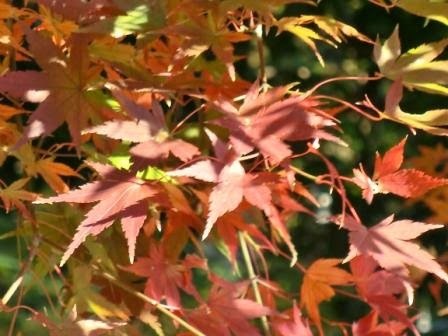 Enjoy Japanese autumn! 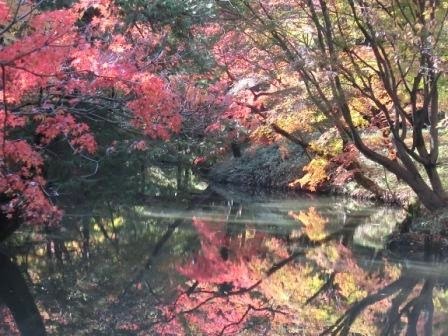 So Rikugien is surely one of the best spots to view Autumn Colors for those who want to explore a calm and beautiful Japanese garden in Tokyo. Also famous for its cherry blossoms. 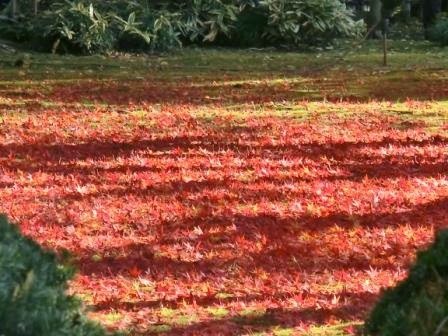 On 26 November (2014,) Rikugien’s website claimed that the best season to view autumn red maple leaves came. It’s definitely true. Fully red! 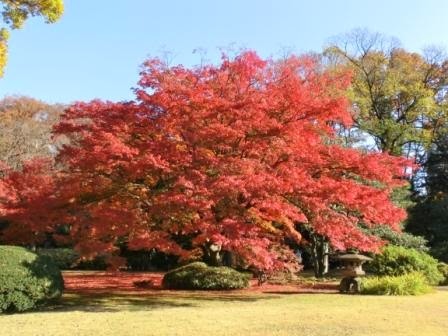 Going into the main entrance, the most beautiful maple tree is waiting for us. The garden lights them up at night. The ground is awesome, too! 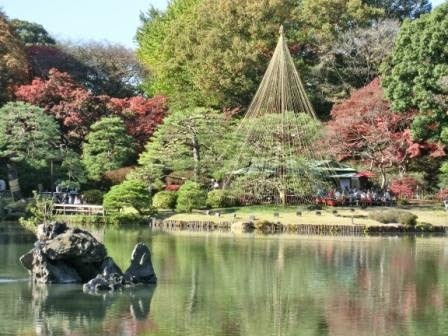 Rikugien Garden is very large; It covers 87,809.41 meters square. You can see a panoramic photo on my Flickr. There are streams and hills in the garden. Which is your favorite spot? Tsutsuji Chaya, benches to take a rest. 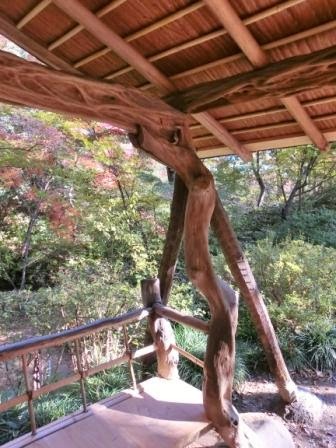 The architecture is rare because old woods are used to support it. It was very fortunate that Tsutsuji Chaya survived world war 2. Let’s have a tea break. 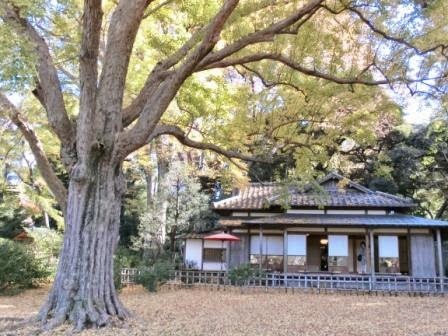 If you want to experience some Japanese tea, I push this “Shinsen-tei” tea house the best of the three tea houses in Rikugien. Why? You’ll put off your shoes to enter, so warm socks without any hole are fine. 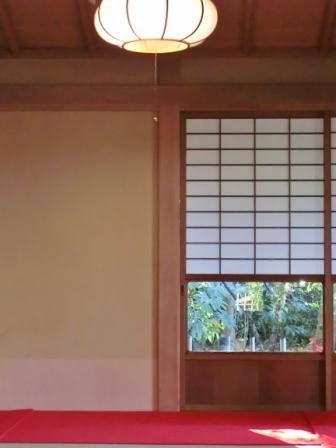 If you like chairs, go to Fukiage Chaya tea house. You’ll enjoy the same set on a bench. Matcha green tea and a Japanese refreshment set. 510 yen. The shape of the refreshment depends on the season… and so on. Mine is a maple leaf! It is an all-sweet refreshment made from sweet beans, so I don’t think it is something to be afraid of. Matcha is made from green tea powder, which is a nobler style than normal green tea. It is undoubtedly part of Japanese culture and it is often used as a flavor for ice cream, cakes, drinks, and so on, but we have few chances to experience matcha in the original style like this. That’s because the classic matcha ceremonies are so classic that few people are involved! 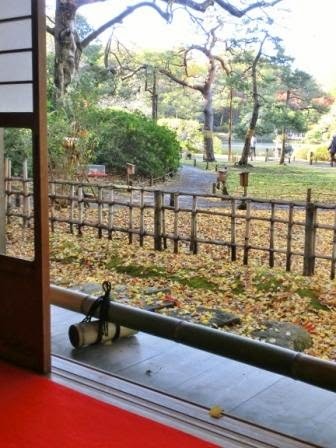 But in Rikugien Garden, we can casually drop in at the tea house and experience it. Can you see how rare it is? It is nothing but special for matcha-loving people including Japanese locals like me to have a cup of classic matcha and traditional refreshment. 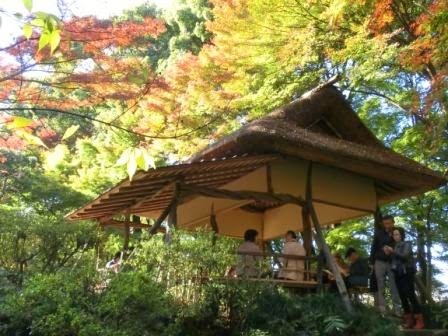 I suggest you that the matcha experience is a MUST when you visit Rikugien Garden! Happy to share a beautiful day in autumn! 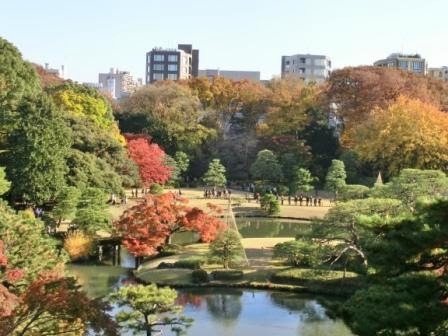 Koishikawa Korakuen Garden – It’s inside Tokyo City as well. 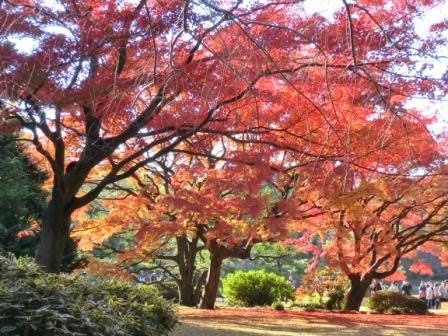 I recommend it as well as Rikugien Garden! 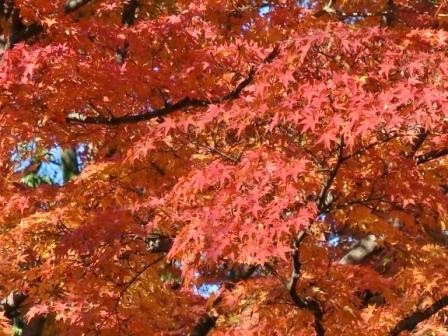 A Day Trip to Kamakura – Samurais’ old capital is so beautiful in autumn. In my opinion, it’s really a great day trip destination from Tokyo. 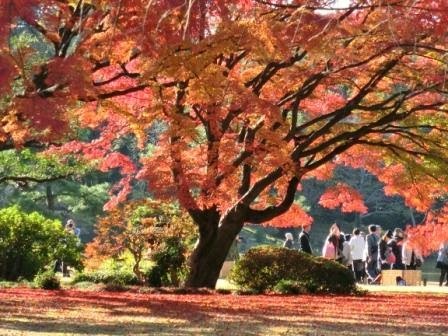 A 7 minutes walk from Komagome station of JR Yamanote Line and Namboku Subway Line. In high seasons, Somei-mon Gate is open for convenience. 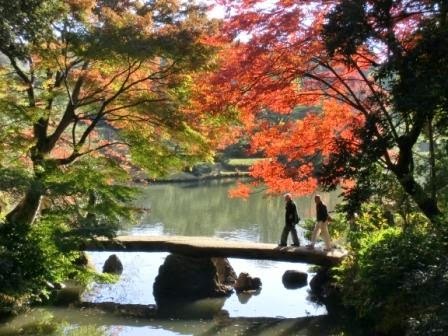 Anywhere in Tokyo is convenient to visit Rikugien because JR Yamanote Line, the loop line of Tokyo City, runs nearby. Ikubukuro is the nearest district, but Ueno, Shinjuku, Shibuya, Hamamatsucho, Shinagawa, Ebisu with Christmas lights are also good choices. Wow! I LOVE that RED! Yes. 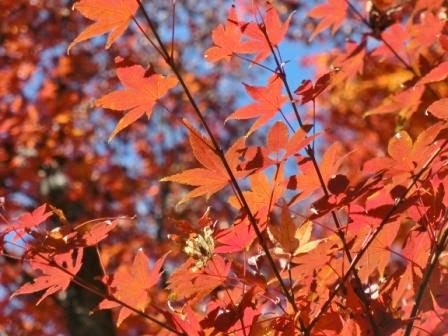 Japanese autumn is definitely the season for RED! 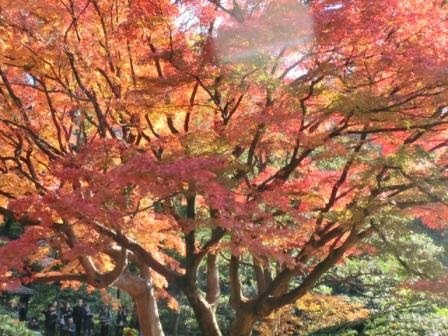 Cherry blossoms in spring attract so many people, and cherry blossom posts are popular on this blog, but autumn with fall foliage is another beautiful season in Japan. I love autumn!